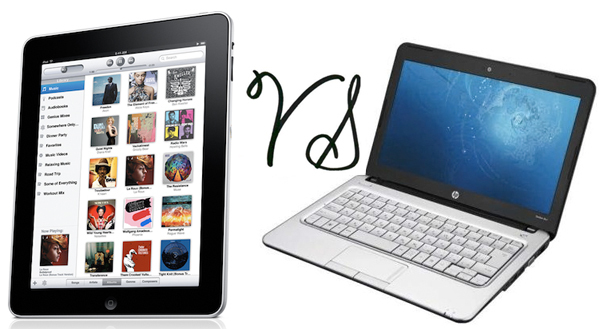 Tablets Versus Laptops: Is One An Alternative To The Other? Do you want to get that new tablet thing on the market, one that we’re officially allowed to call a “personal computer?” Or do you think you’re better off with your laptop, at least it has a keyboard. The rapid pace of technological innovation is leaving us confused (should I mention Bankrupt!!!). One day you are using your laptop and the next, you wake up to find that the fancy has shifted to the tablet, the new gadget wonder-child. Figures are in and the sales of laptops have clearly slowed down after years of growth. Sales of the lighter and smaller-sized tablets are expected to reach 126 million units this year, in comparison to the 68.4 million units sold last year. Why this interest in the tablet? Portability is the first thing that comes to mind. It is the key aspect of any computer today. (Can you imaging taking a desktop PC to bed to read a book!!). Lightweight LCD screens made the dream of curling up in bed reading a digital book a possibility. Do your chatting sitting on the park bench. The lighter the better! Is The Tablet an Alternative to the Laptop? Human nature being what it is we need upgrading. We are continuously seeking the ultimate convergence device (a device which can be useWith all this adulation for tablets, many have rung the death knell of the laptops – but here’s a dose of realityd as a PC, camera, phone, internet browser, television, mapping etc…Short of being used as a killer weapon too), and we go crazy trying to figure out which products are better, to the extent that we even forget what we are looking for. Tablets may have initially met with some skepticism but consumers are now clearly enjoying tablets over laptops and PCs. American Consumer Satisfaction Index recently revealed that tablets have driven the satisfaction rate for the entire PC market to the highest ever – an 80 out of 100. In fact, things are happening so fast that larger tablets are already losing some ground to their smaller siblings, like the 7-inch tablets. There are also rumors about a mini-tablet from Apple. A great distinction remains between the laptops and tablets. Even as the population of tablet owners broadens, the assumption that we have entered a post-PC or laptop era is overstated. Laptops continue to be an enduring part of our lives. Even today we use desktop PCs as there are benefits only they can offer. Tablets are information consumption devices and laptops are content creation devices. Tablets aid us with portable decisions, but they are not built for high production of content. On the other hand laptops are also portable and nearly mobile. There are many people, including road-warriors like me who write and create content, who feel the need for a keyboard and a larger screen. Both graphics and text-based content will continue to demand the capability of a laptop for writing, editing, and presenting. Let’s take a look at what the tablets and laptops offer. Portability is a very dynamic property and with better composite materials, smaller and advanced circuitry, both the tablets and laptops are getting more portable. If you just look at the size, as of now, tablets are a hands-down winner here – particularly the 7-inch and 8-inch screens. Even the lightest laptops are still heavier than most tablets. Portability has to be assessed based on “why” you are carrying around these devices. Tablets are great for simple tasks and entertainment, but advanced tasks require additional features and more horsepower. Compared to a laptop, most tablets are affordable. While the high-end iPad models cost more than low-end laptop models – you can get most other tablets for around $200 or even less. By choosing a tablet, you could end up saving hundreds of dollars, but it all depends on the features you are looking for in your tablet or laptop. Apple’s iPad and Samsung Galaxy tablets have wonderful screen resolution and watching YouTube clips, surfing the web, emailing or reading a book while commuting or waiting for a bus can be a beautiful experience. What do you do when it comes to a large business-related presentation? Tablets offer you a wealth of apps that can be downloaded. Productivity apps such as Google Docs and QuickOfficePro (for Microsoft Office users) help to a certain extent. But the software that comes with laptops is far better. It is also frustrating to type for long on a tablet and I can tell you from experience that it’s a cramp-inducing experience. I’ve tried attaching a keyboard to my tablet, but it’s not the same. The higher processing power and memory of a laptop can handle all the power-hungry tasks, including photo editing, watching movies or TV. Even for those looking for more complex and graphics-intensive gaming, a high-end laptop is probably best. For some, they need a large screen to work on, and tablets just can’t scale up to have a huge screen as that would defeat the purpose of a tablet. Suddenly the boundary between tablets and laptops is blurred. Some tablets come with a keyboard dock that transforms the tablet into a laptop. The Asus Eee Pad Slider has a slide-out keyboard. I’m also looking forward to the specially designed keyboard accessory that Microsoft is bringing out with Surface. Laptops have an edge here as most of us are used to a keyboard and typing on the screen is just not the same. We may soon not care too much for a keyboard as more and more content becomes available for touch input. There is also a trend that shows an increasing demand for data input using voice. Speech to text interface is already quite powerful and this technology will only get better, making laptops lost their keyboard edge. Although tablets may be easier to take around, their exposed touchscreen makes them susceptible to damage if you happen to drop them. But if you love the touchscreen capability of a tablet, you can always use a protective case. Tablets combine the features of a laptop and a smart phone. It’s very easy to download apps and do everything you need to do. Based on the tablet mode, you can surf the web, type documents, take photos and do much more. There are add-ons and programs that can be purchased to expand the tablet capabilities. Tablets come with a maximum of 64GB flash storage. Of course, Microsoft’s new Surface tablet model has 128GB. But laptops can go up to 250GB. You can throw in a larger hard drive or memory of any size on a laptop and tablets lack this flexibility. Tablets are designed to be efficient with low power requirements. The battery occupies the majority of the interior of a tablet, while the battery component of the laptop is smaller. Even with a higher capacity battery, laptops do not run as long as a tablet. Many tablets today come with about ten hours of battery. The average laptop runs for 3-4 hours on an average, with a few stretching out to eight hours. Instant on is a major plus in tablets. It only takes a few seconds to wake them up from the deepest of slumbers. Just click a button and the tablet is up and running. Most people don’t pay attention to this aspect, but it can prove to be critical. A stand-alone device describes a device one would use as the only computer system. A laptop is self-contained and can be used a complete computer system as far as loading programs, data and backing up. Many tablets need additional computers for backing up the device. On a laptop, you can save files, organize them in folders, and keep them either on the desktop or transfer to a USB or external hard drive. You will find all your files in one place. However, on a tablet, a file can be accessed only from the app you used to create it. If you receive a Microsoft Word document as an attachment in an email, with a laptop, you can save this document anywhere on your hard drive. On a tablet, you have to use an application supporting Word documents to open it. The document will then be saved in that particular app directory, and will be accessible when you open that app. Files can be transferred between two compatible apps. When you want to transfer files, your laptop allows you to just plug in a USB stick or external drive, read the contents, download the files or save them. But this is not possible on all tablets. Although Google Android is smart enough to give USB compatibility to its tablets, many others including the iPad don’t have the facility to plug in a USB or external drive. There is the Photofast iFlash Drive and a few other USB sticks and external hard drives created only for the iPad, but there are limitations. There is no facility to transfer files from the iPad to the external drive, and the USB is very expensive. A Tablet or a Laptop? Our Verdict! At this juncture, a tablet or a laptop – it really depends on your specific need and preference. If you decide to get a tablet, instead of trying to use your new tablet as a laptop, try and understand the logic of iOS. Get used to the USB alternatives like the Cloud and wi-fi sync tools like Dropbox and you will have a much easier time understanding a tablet. Laptops are here to stay for a long time to come, but tablets may be omnipresent. Laptops are slimming down in size and weighing less, but just as tablets may never be close to laptops in their processing power and screens without increasing their size, similarly laptops may never be small enough to compete with the tablets in size without compromising on their power. Each device, whether a laptop or tablet, fills a role and can be employed for specific purposes. So, why not use both?